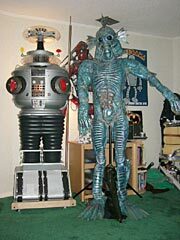 B9 Robot Club member Jim Quinlan won a creature costume on eBay and wondered where it came from. The photo at left shows the six-foot costume next to his Lost in Space robot (click on the image to enlarge). 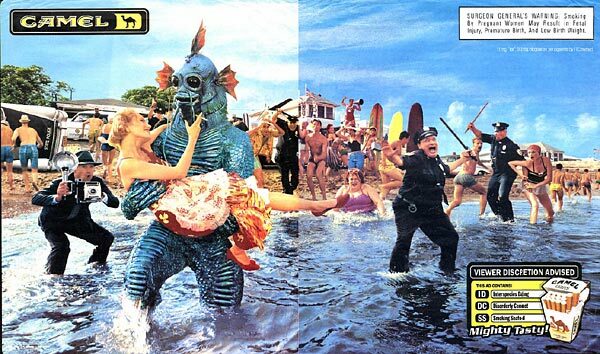 Before mounting an expedition to the Black Lagoon, I checked my clipping file, thinking I had seen the monster in print before. Here, revealed for the first time anywhere, is the origin of this curiosity. The ad below is from a magazine from the late 1990s. Jim has more photos on his web site (click here to visit). It's worth a look; he has lots of cool stuff.